Wikipedia defines Gamification as “the use of game thinking and game mechanics in non-game contexts to engage users in solving problems”. While Gamification has been applied in several domains, our focus has been on its application in learning. Research certainly confirms the advantages of learning through Gamification. Let me share a case study that compares the gains in learning achieved through serious game concept vs a traditional eLearning approach. Wikipedia defines Gamification as “the use of game thinking and game mechanics in non-game contexts to engage users in solving problems”. As per Wikipedia, “Gamification techniques strive to leverage people’s natural desires for socializing, learning, mastery, competition, achievement, status, self-expression, altruism or closure. Gamification strategies include use of rewards for players who accomplish desired tasks or competition to engage players. Types of rewards include points, achievement badges or levels, the filling of a progress bar or providing the user with virtual currency. Making the rewards for accomplishing tasks visible to other players or providing leader boards are further ways of encouraging players to compete”. Research certainly confirms the advantages of learning through Gamification. Let me share a case study that compares the gains in learning achieved through serious game concept vs a traditional eLearning approach. 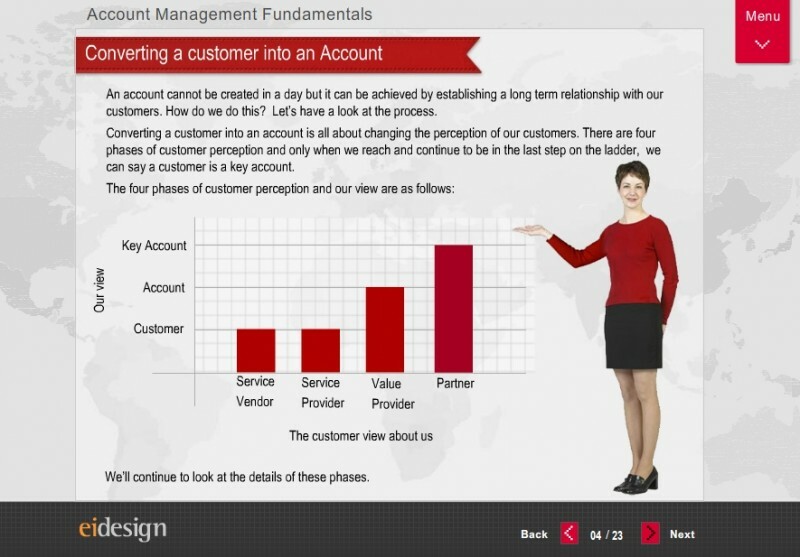 We had to design a quick online training for Project Managers who were being groomed to handle Account Management practices. The course on Account Management Fundamentals outlined the basics of account management and more specifically, what they must do to move their organization up the value chain. The first solution was in a traditional eLearning format. 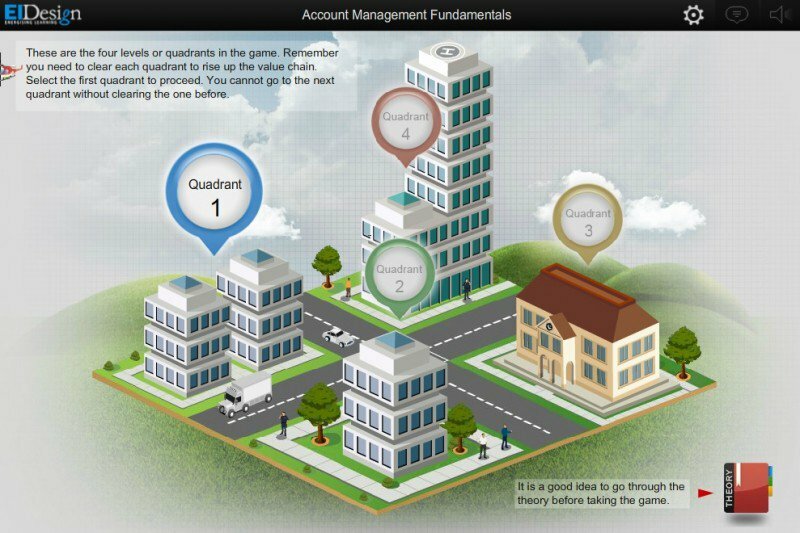 To get the online training quickly off the ground, we used the Articulate Presenter based approach to present the basics of Account Management. This is what the first version of the course looked like. The initial mandate was to quickly train the Project Managers on the essentials of Account Management and this was met. However, the feedback from the learners was that they need specific cues on how to accomplish each step to move up the value chain. We reworked with the revised learning mandate and now chose a Gamification approach. The key objective for the learner was to understand how to meet the organizational mandate to graduate from Level 1 association with customers (as a service vendor) and move up progressively to Level 2 (as a service provider), Level 3 (as a value provider) and finally to Level 4 (as a strategic partner). These four levels were mapped to four challenges/quadrants as shown in the first screenshot. The entire learning was driven through interactive scenario based questions (based on real life situations) that the learners had to attempt at each level/quadrant in the game. Based on their responses that enable them to clear a given quadrant, they would be provided access to move to the next one. The approach was designed for scalability wherein the questions could be easily updated. We also provided a randomized pooling of questions to ensure that on every return, the learner encountered some new challenges. The second screenshot presents the rules of the game.Learners had the option to refer to the learning content at anytime in the game as a lifeline. On successful completion of all four quadrants, the learners had gone through typical situations they are likely to face in real life, practice them in a safe environment and realize their goal of becoming a true Account Manager. This approach met the mandate and the serious game concept enabled the learners to handle the real life challenges in an engaging and immersive format. The ongoing updation of the question bank and their randomization kept them intrigued and also enabled them to continuously hone their skills. This is one of the few blogs that I visit on a regular basis and am never disappointed with what I find. Great insight. Thanks for keeping the great information regarding Learning and Development Conferences and gamification. Keep Posting! Thank you for sharing the information Asha!